Herman Klok (1968) is a hotelier with experience in repositioning and renovating hotels. He describes himself as a nomad and has lived and worked in cities such as Chicago, Dubai and Brussels. 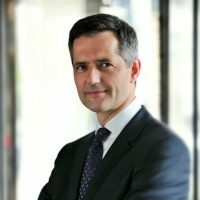 In 2013, Herman started his career at NH Hotel Group as Hotel Director of NH Collection Amsterdam Grand Hotel Krasnapolsky. He and his team have successfully repositioned the gastronomic offer of the hotel, which consists of Michelin starred restaurant The White Room*, Grand Café Krasnapolsky and Bar The Tailor, the best bar in Amsterdam according to TripAdvisor. In June 2018, Herman was promoted Cluster Manager for NH Collection Amsterdam Grand Hotel Krasnapolsky and Pre-opening Hotel Director for now Amsterdam RAI, to be opened in Q1, 2020. As from 2018, Herman oversees the hotel operations for NH Hotel Group in the role of Regional Director of Operations Amsterdam, UK and Switzerland.